One can find seafood and ethnic dishes almost anywhere, but the charming town of Old Saybrook, Connecticut has to be at the top of the list. With a long history of Italian, Greek, Irish, and English immigrants, you know that the food will be fabulous. It’s a feature that complements the diverse choices of leisure entertainment and activities here. From simple breakfast with a cuppa morning Joe, to elegant dining in beautiful surroundings, the Old Saybrook food scene is one not to be missed. Boasting an extensive list of specialty beers, Braise & Brew Tavern is the place to be for happy hour where you can snack on small bites like Buffalo Chicken Spring Rolls or Smoked Mac & Cheese Bites or Banging Twisted Shrimp—a champagne tempura with scallions and creamy Thai chili sauce. Yum! Lunch and dinner specialties offer equally intriguing dishes: Crab Cakes & Roasted Corn Salsa, Lobster & Asiago Bisque, Smoked Mozzarella Chicken Panini, or Black Pearl Pan Roasted Salmon. Open Tues-Sun; check website for hours. Touted as “a tiny slice of Italy,” Caffé Marche fashions the atmosphere with the simple recipes and flavors of the Marche region in central Italy. Lunch here is a quiet treat of authentic Italian recipes served in the quaint surroundings of the historical James Pharmacy. Assorted soups, salads, sandwiches, and pasta make up the lunch menu. Earlier in the day, enjoy the finest coffees and teas along with homemade pastries or gelato. Open Tue-Sun, 8 a.m. - 5 p.m.; lunch served 12 - 2:30 p.m. Delicious pastries and baked goods are made in-house at Cloud Nine Catering Café, but the great food doesn’t stop there. House-made soups, fresh sandwiches and salads, and even a BBQ dinner are available. Need breakfast? They can do that, too. For spectacular and specialty cakes, consider Almond Joy Cake or Truffle Cake with Chocolate Crust, or try one of the cheesecakes. Deli open Tues-Sat, Catering Office: Mon-Sat, check website for hours. You can’t go wrong with a restaurant that was voted #1 Best Mexican, Best Chili, and Best Brunch by Connecticut Magazine for 2018. Locally owned and operated, the Cuckoo’s Nest has been serving fabulous food for more than 40 years. Some house specialties include Tuna Chimichurri, Shrimp Ranchera Enchiladas, and of course fajitas and tacos. Vegetarian? No worries, the menu includes four specialty vegetarian dishes with all the fixin’s. Great food with music on Sundays with an All-You-Can-Eat Brunch Buffet. Open 7 days a week; see website for hours. After more than 60 years, Johnny Ad’s place is a local institution with some of the best seafood around. The small restaurant offers indoor seating, or a picnic experience outdoors. Or get an order to go for a boat trip or drive. The menu features Lobster Rolls and Soft Shell Crab (in season), as well as scallops, shrimp, flounder, calamari, and the good old standby, fish & chips. And all seafood is fried with natural Frymax ZT with 0g of trans fat per serving. Open year round, 7 days a week; check website for hours. Families, friends, couples, and co-workers gather at this friendly neighborhood pub featuring interesting and different fare. Consider a Cheeseburger Quesadilla—ground beef, melted cheddar jack cheese, diced tomatoes, onions, crispy bacon, sliced pickles and crunchy tater tots in a grilled flour tortilla, served with Russian dressing! Open 7 days a week, 11:30 a.m. - 10 p.m.; bar open later. Enjoy the finest seafood in an elegant setting, everything from casual to raw bar to full main course. Liv’s raw bar features Cherrystone Clams, an Oyster Sampler, and a Shellfish Sampler, to name a few. Soups, salads, and casual bites pair nicely with an extensive wine and specialty cocktail list. Owner and executive chef John Brescio takes pride in using his training from the French Culinary Institute, and experiences at Tavern on the Green and Judson Grill in New York City. His passion shows in the food he prepares. Open Wed-Mon, closed Tues; check website for hours. Another Old Saybrook family restaurant, Luigi’s has been owned and operated by the DiBella family for more than 60 years. If you’re looking for “Old Country” Italian food, this is the place. Everything is home-cooked and made from high quality, all-natural ingredients and the best imported pastas, olive oils, and aged cheeses. In addition to the familiar dishes, Luigi’s offers some Italian specialties like Cavatelli and Eggplant Parmigiana, and a Vegetable Lasagna. For a lighter meal, try a pizza or grinder. Plenty of other good food, generous drinks, and lots of fun. Open Tue-Sun; check website for hours. Steak lovers rejoice—hand-cut steaks are done to perfection at this American Bistro at the Mystic Marriott Hotel. Not only beef, but local seafood and an award-winning wine list make Octagon a destination for an amazing experience. Beautiful relaxing decor and excellent service complement the extensive menu. For simple fare, try the Bacon Cheddar Burger or Penne Vodka; settling in for an evening dine-out, start off with Chilled Leek and Potato Soup, Beet Salad with goat cheese and candied pecans, then follow with one of the steak entreés or Atlantic Swordfish, Lobster Fra Diavolo, or a fresh Summer Vegetable Terrine. Open 7 days a week; check website for hours. Breakfast all day! That’s a feature at Parthenon Diner, and what a breakfast it is. Eggs every way you can imagine, 10 fabulous omelets, breakfast sandwiches, griddles, and specials like Hungry Man and Really Hungry Man. Or how about Roasted Butternut Squash Hash & Eggs for the vegetarian at the table? Nominated as a Best Diner, Best Breakfast, and Best Greek Food restaurant, Parthenon is a chance to slip into the nostalgia of hometown diners. Open 7 days a week at 6 a.m. Situated on Main Street in the heart of downtown, the Penny Lane Pub has long been a favorite eatery and watering hole. Comfortable booths and a cozy bar on the first floor provide a relaxing and pleasant place to enjoy excellent American dishes. Quieter, more intimate surroundings are available upstairs. 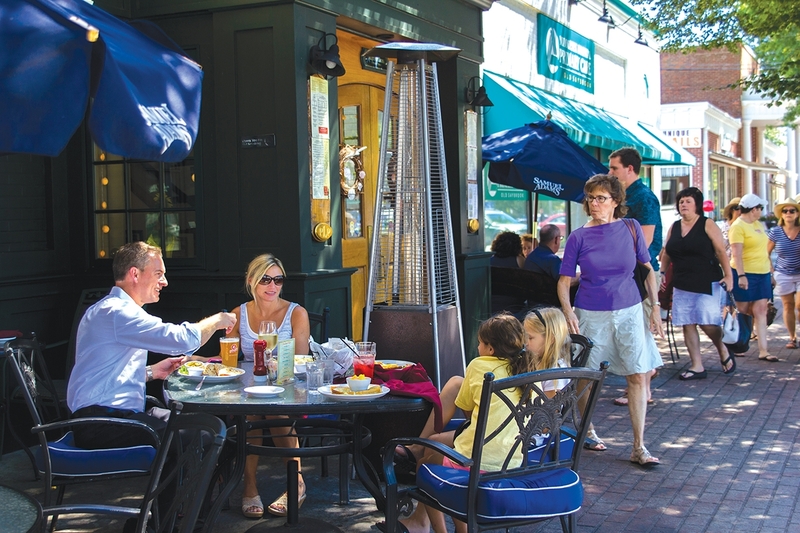 Summertime brings outdoor dining on the Main Street Patio and Portobello Alley. Penny Lane is well known for its traditional Reuben Sandwich, and also offers classic fish and chips or shepherd’s pie—in true English pub fashion. Open 7 days a week; check website for hours. For an exceptional variety of Greek, Italian, and American dishes, visit this family business which has served the area for 39 years. Greek pizza is special and the Palace does it right, assuring that the dough is prepared daily. Other Greek specialties include moussaka, spinach pie, and gyros. Try a grinder or a gluten-free pizza, or order a party tray for your next event. Open 7 days a week, 10 a.m. - 10 p.m. The advertisement says “warm, cozy, and inviting” and that’s a perfect description for this delightful restaurant in Old Saybrook. Wonderful food and a wide variety includes all the regular offerings of sandwiches, salads, soups, and burgers. For a more unique meal, try one of the elegant seafood entrees like Scampi Bianco or Lobster Madeira. The Chef’s Creations menu features about a dozen dishes that all sound mouth-watering. And don’t forget dessert: Coconut Torte or Apple Crisp or Key Lime Pie or one of several more. Open Mon-Sat, 11:30 a.m. to close. Reservations are suggested. A pizza parlor with something for everyone—eat in, take out, delivery, or have a pizza party. This restaurant takes great pride in offering only the freshest toppings and tastiest sauces on their one-of-a-kind pizzas. But that’s not all they do. Wraps, burgers, stuffed breads, pasta, baked dishes, grinders, calzones, panini, and main entrees fill up the menu, which includes special dishes just for kids. Open Tues-Sun; check website for hours. For vegan or wheat-free/gluten-free food, Shayna B’s is the go-to place. Deliciously different, using seasonal and organic local products and no GMO, these goodies are sure to please. Coconut Maccaroons, Oat Free Granola, Josie’s Berries & Cream Chocolate Bliss, Soy Free Mini Bundt Cakes, and freshly baked breads and rolls, to name just a few. The store is open Tues-Fri, 10 - 6 p.m. and Sat-Sun, 10 - 4. Gluten Free Vegan catering also available. Unanimously voted as the Best Thai Restaurant in the region for the past 15 years, Som Siam East is a gem in Old Saybrook. All fresh and made to order, the menu includes such dishes as Peanut Curry, Pad Thai, or Garlic Duck. The lunch menu consists of 20 choices, served with dessert and soup or salad. Open 7 days a week; check website for hours. The Back Porch is a dining spot located on the Connecticut River with beautiful views and enjoyable outdoor dining during the season. Whether you order shoreline classic dishes like Beer Battered Fish & Chips or a simple meal of New England Clam Chowder and a Turkey Club Sandwich, the food will be fresh and tasty, cooked to order. During the season, be sure to take in some the best local musical entertainment five nights a week. Open April through September; check website for hours and events. Fine dining at its best, a transition between old New England charm and upscale elegance. View the art of the culinary from your table through the open space, where chef Colt Taylor prepares the freshest local products from farm and sea. A different and fun approach to a meal is Omakase, where diners will sample and preview dishes not yet on the menu, but being considered. For regular dining, enjoy selections from the main menu. Consider Long Island Fluke “a la meuniere” with caperberries, cauliflower, and broccolini, or Bouillabaisse, or Misty Knoll Chicken. Whatever the choice, it will be memorable. Open Tues-Sun; check website for hours. A local favorite hangout for 50 years, this bar and restaurant has been owned by the same family since it opened. Casual and comfortable, with friendly staff and customers, Monkey Farm Café has whatever you’re hankering for—grinders, steaks, seafood, soup, and a dessert menu to die for. Peanut Butter Pie. Key Lime Pie. Chocolate Cake with Oreo Cheesecake Filling. Carrot Cake. And more! Oh, and plenty of libations. NOTE: Cash only, no credit cards, but there is an ATM on the premises. Open 7 days a week, 11:30 a.m. - 11 p.m.
A friendly place with the customer in mind, this restaurant specializes in paleo and gluten-free meals, as well as regular fare. The extensive menu offers plenty of choices for most dietary considerations. Breakfast and lunch are served until 3 p.m., seven days a week. Known for fresh, specialty jumbo pancakes like Brownie Delight, Blue Pig in My Blanket, Peanut Cup, Cranberry Walnut, and more than a dozen more. Looking for a burger to remember? Try the Randy Rhodes Burger with apple wood smoked bacon, melted cheddar, and yellow mustard. Or Garlic Buffalo Burger with bleu cheese, lettuce, and tomato. Open at 7 a.m. every day. Family owned and operated, TJ’s has been a local favorite for years. Featuring daily specials like Chicken Ala Vodka, or Crispy Chicken Wrap, or homemade Lasagna, you’re sure to find something delicious to eat. The extensive menu includes all types of appetizers, soups and salads, grinders, burgers, sandwiches, wraps, calzones and, of course, pizza—more than 16 different combinations. Looking for dinner? Full Italian specialty menu with poultry, seafood, pasta, and beef will give you plenty of choices. Children’s menu available, and a nice wine list. Open 7 days a week, 11 a.m. - 9 p.m. Cute café right in the heart of Westbrook is known for breakfast fare. How about Steak & Cheese Omelet, or Salmon Frittata, or the Hangover Sizzler—home-fries topped with scrambled eggs, bacon, tomato, melted cheddar, sausage gravy, and scallions. Voted a Top Restaurant three years in a row. Open 7 days a week; check Facebook page for hours.